Tibo's new product line aims to make your hi-fi smarter | What Hi-Fi? The focal points of Tibo's new line up of products, which we were shown recently on a tour of its headquarters in Milton Keynes, are twofold: to sell kit that fits into the continually more connected smarthome future, and to be able to manage audio on those products easily and efficiently. Tibo bills its kit as "the world's largest range of smart audio", and the item that immediately takes our eye is the £100 Choros. Arriving in the shops in May, this cuboid speaker will be available in four sizes (small, medium and large - pictured above - alongside a portable version). Each of these speakers has Alexa Tap built in, using the AI technology in Amazon's Echo speaker. Holding down a button on the top of the device activates the Bluetooth assistant, which you can then ask to perform a variety of tasks, such as stream music via wi-fi, set alarms, or any of Alexa's other skills. According to Tibo, the Choros has a sound quality comparable with speakers from Sonos, which has also made its products compatible with Amazon's Alexa. Tibo might be able to offer a more competitive price, though, as Sonos recently increased its prices. For those who would rather have a Google-brand connected home, Tibo says the technology for its Google Assistant will be made ready in the third quarter of 2017 - although, due to the extra cost of the software development kit required, this will lead to more expensive products. It's unlikely that one speaker will be able to have multiple assistants built in, so customers will have to make a decision on which brand they want answering their questions and giving them the weather forecast. Tibo believes that, because of Alexa's prevalance in smart-devices in the UK, it will be the most common assistant, followed by Google. It also believes that, despite the relative unpopularity of Siri, Apple will take third place because it already has a cloud-based language algorithm - a technology that Microsoft's Cortana, which currently is only in a Harman Kardon speaker, lacks. Following the Choros to market is Tibo's £250 Smart Amp, which is being launched in April. This amplifier has a number of direct pre-sets including Deezer, Spotify, and TuneIn radio, as well as wi-fi and Bluetooth connectivity (similar to the Choros). A neat little touch to the device is that it has verbal feedback for each input, so changing to Bluetooth will have the amp announce "Bluetooth" in a pleasant tone. 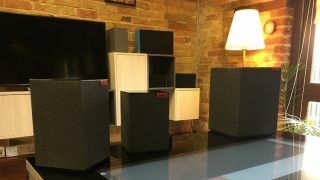 Tibo was also keen to show off its Vogue range of wireless speakers, including the £170 Vogue 1 and the £230 Vogue 3. These speakers have the same amplifier and driver as the Choros M, as well as similar connectivity and pre-sets. With their leather handle and USB charging, these speakers are aiming for the portable market - and because of some of the extra tech built in, they have some extra tricks up their sleeves. The first is the 'Bounce' technology, which allows you to stream audio from one device to another, up to a distance of 10m (and up to 16 devices). This means multiple Tibo speakers can be connected for a bigger sound. You can also set two speakers up as a stereo pair, using the company's "Hi-Fi Ready" technology. A Tibo app allows you to stream separate audio to separate devices. So the Choros in your bedroom could be playing a Spotify stream while the Vogue speaker next to you in the kitchen could play the same stream, something from Tidal perhaps, or music native to your device. Any Tibo product can be synchronised or separated from this network using the app's simple to use drag-and-drop interface. Alongside these products are more portable speakers - the Sphere range - a number of passive speakers - the Legacy and Harmony ranges - as well as the Alchemy mini system. There's also an all-in-one package called the Kameleon that has Alexa support and comes with a 7in tablet used as a 'control centre'. Many companies are looking to fill this connected space while providing good audio quality at the same time; Tibo's range of products shows that it is clearly aiming high. We look forward to bringing you reviews of the various products as soon as we can.